Due probably to the bank holiday weekend, numbers were reduced slightly this week with 20 runners turning up on a perfect morning for a 10k. It was bright, dry and cool, without a hint of a breeze – perfect conditions for setting a personal best! The first athlete home was Tony Fitzpatrick in a fantastic personal best, almost 2½ minutes faster than two weeks ago. Tony had set himself a target of 50 minutes for this race and he smashed that time powering home in 48:08. Tony was followed home by Noel Gorman who maintained his steady progress by shaving another couple of minutes off his pb. In third place on the day was Gerry Fahey in 42:15. First woman home was Bernie Kelly who ran very strongly to take over a minute off last weeks time, easing home in just over 48 minutes. Bernie was followed by Kathleen Waters who took a further 30 seconds off her pb of 2 weeks ago. Josephine Gardiner ran slower than usual but was still the third lady home and the fastest female in a time of 41:21. Michael Tobin was again the fastest runner in a consistently good time of 36:53. 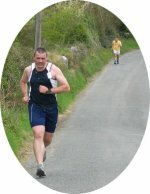 However Darragh O’Brien’s big improvement this week to 37:20 suggests that Mike may not have it all his own way in the quest for the fastest runner prize. Another runner that would have really put it up to Mike, Mick Rice was going very well but unfortunately got lost on the course today. If Mick gets his geography sorted, he may be around in the shake-up for fastest runner prize at the end too. Owen Curren from Athenry AC also ran a great race to be the only other runner to break 40 on the day. There are several photos from the event in the photo gallery. Unfortunately, Brian Murphy pulled up with a hamstring strain on the 8th k – hopefully this is just a minor twinge and he’ll be back in action soon. In the league table, Noel Gorman’s consistent improvement has given him a slim 1 point lead but there’s still all to play for! Kathleen Waters is going very well for the best female award, but it’s still only half way so early days! I am going to talk to Mike about changing the calculation slightly for the points total to make draws less likely – but the order should not change at this stage.